October 30, 2013 - Third-party logistics provider Kane Is Able, Inc. (KANE -- www.kaneisable.com) is pleased to announce that Kimberly Kavaliauskas has received the Woman of the Year Award from the National Association of Professional Women (NAPW). NAPW is membership network that offers professional women a forum to network, exchange ideas, promote their businesses, and advance their careers. Kavaliauskas, is the only member from the Scranton Chapter of NAPW to receive the award, which was granted to fewer than two percent of the 580,000 NAPW members in the United States. Jennifer Rivera, Director of Membership Services at NAPW, said that Kavaliauskas was chosen for the Woman of the Year Award "based on her prominence and demonstrated leadership capacity in her industry, as well as her commitment to professional growth." Kavaliauskas is the Maintenance Manager at KANE. She is responsible for the maintenance of more than 900 pieces of equipment at the Scranton campus and at the Tunkhannock and Pittston facilities, and she manages more than two million square feet of building space for the Scranton campus and the Tunkhannock facility. 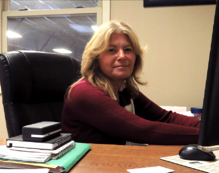 Previously, Kavaliauskas served at KANE as a freight customer service representative, a dispatcher, and as the Mehoopany transportation manager, before being promoted to her current position. In May, Kavaliauskas celebrated her tenth year of service with KANE. A lifelong resident of Mehoopany, Pennsylvania, Kavaliauskas received her associate's degree in paralegal studies from Boca Raton, Florida. She is active with the Technology Maintenance Council of the American Trucking Association and with the Building Maintenance Council.